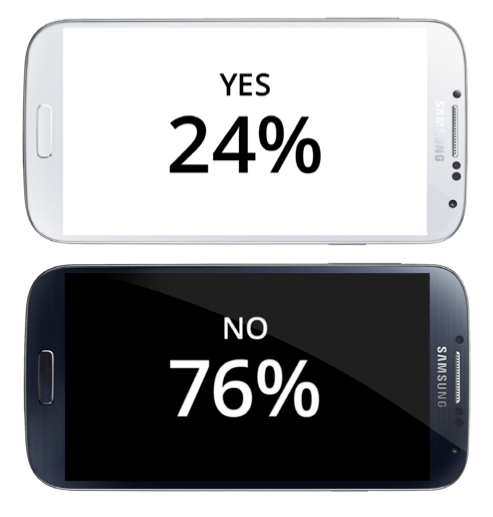 A survey from Education Dive examines how CIOs use their smartphones and tablets. Most people use smartphones and tablets on college campuses — even CIOs. Wouldn’t it be interesting to know how those top administrators use their mobile devices? Do they check Facebook? Do they bring their own devices? For the first time, the higher education community has access to this information, thanks to a survey conducted by Education Dive and sponsored by Sprint. The 2013 CIO Survey asked 50 college CIOs what they thought about security, BYOD (bring your own device), infrastructure and the future of mobile. The results are fascinating, so we have compiled a few key insights below. Be sure to download the full survey here. Did your organization provide your smartphone or tablet? 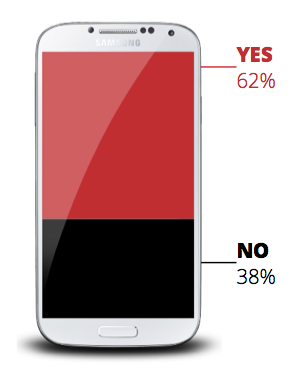 It turns out that the majority of CIOs don’t BYOD. Given the access a CIO would have to potentially sensitive data, this isn’t very surprising. It’s worth noting the significant difference between being an employee and being a student at a major university. No college could afford a one-to-one program for mobile devices, but most equip their staff with similar tools. Should CIOs be bringing their own devices to get a better feel for the needs of students? A full 38 percent are doing just that — and improving their mobile programs because of it. When you wake up in the morning, how long does it take you to check your phone? In this way, CIOs are just like the rest of us. 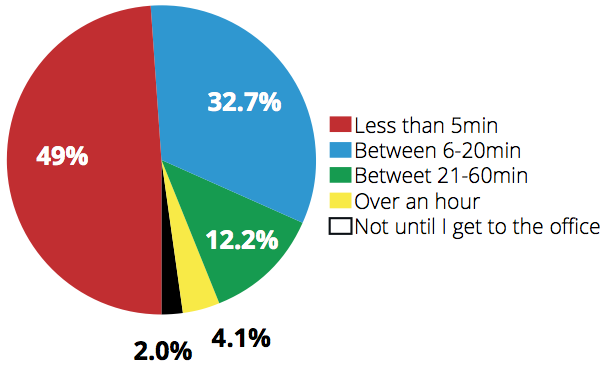 Whether the need is personal or professional, 49 percent of CIOs check their phones within just five minutes of waking up. This is part of an ongoing change in the way we work. The pressure to be connected 24 hours a day is hard to ignore. What 3 smartphone or tablet apps do you use most often for work? If you have any doubts about the relationship between mobile and cloud computing, it’s time to throw them out. 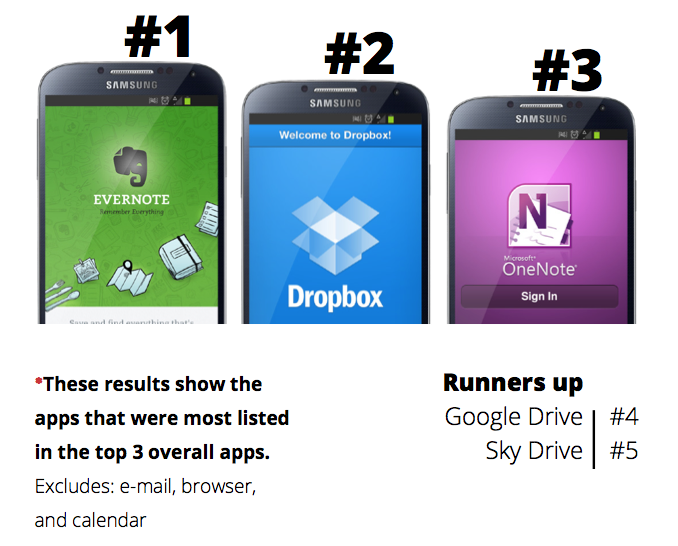 The top five apps that CIOs use to work on their mobile devices rely on cloud technology to sync data across platforms. While this question didn’t take email, web browsers or calendar apps into consideration, nearly all of those services are driven by the cloud as well. Without the cloud, mobile devices are simply not as useful. What are your 3 favorite smartphone or tablet apps that you use overall? CIOs are addicted to Facebook, too! 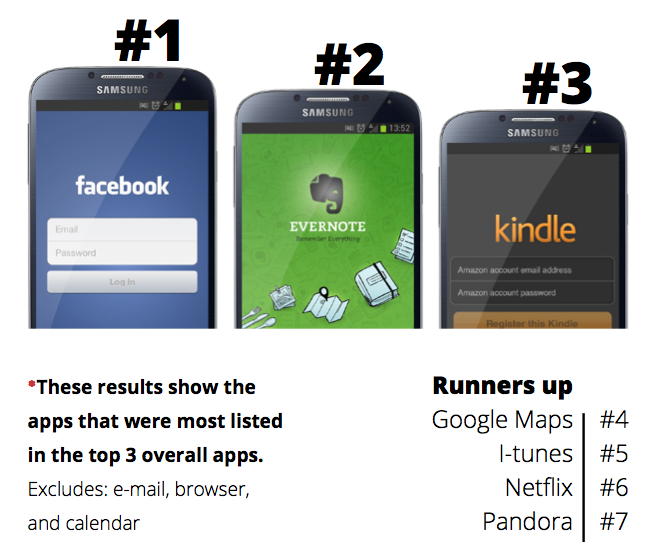 It’s the most popular app for personal use, followed by Evernote and the Kindle app. It’s interesting that most of the popular apps listed have versions for Android as well as iOS. Availability is a huge factor, since many users don’t want to be tied to one particular operating system. Does your university have an official BYOD policy? And now, on to the enterprise-technology section of the survey. Since CIOs are tasked with keeping malware and viruses off their colleges’ networks and devices, it’s interesting that just 24 percent indicated their university has a BYOD policy. Why is it that so many colleges haven’t launched a real policy yet? Perhaps the environment is changing too quickly, or maybe they handle the security on the network side. Either way, it’s an important topic to address, even if just serves as an educational opportunity for students. What is your biggest worry with BYOD and mobility at the university? 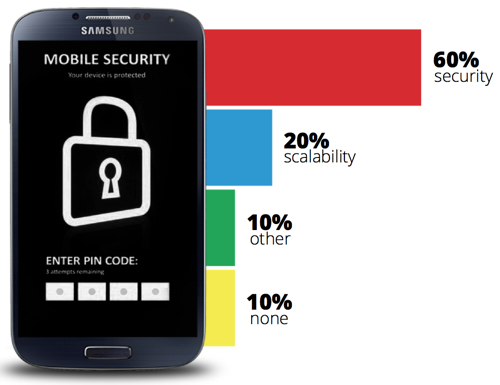 Security is a pressing concern, regardless of the device or the platform. Colleges will need to get this one right, because so much sensitive data is on the line. To complicate this issue, the cloud technology that makes mobile devices so useful creates an entirely separate set of security concerns. It’s a complex issue to be sure, but one that is likely to be at the center of technology for years to come.